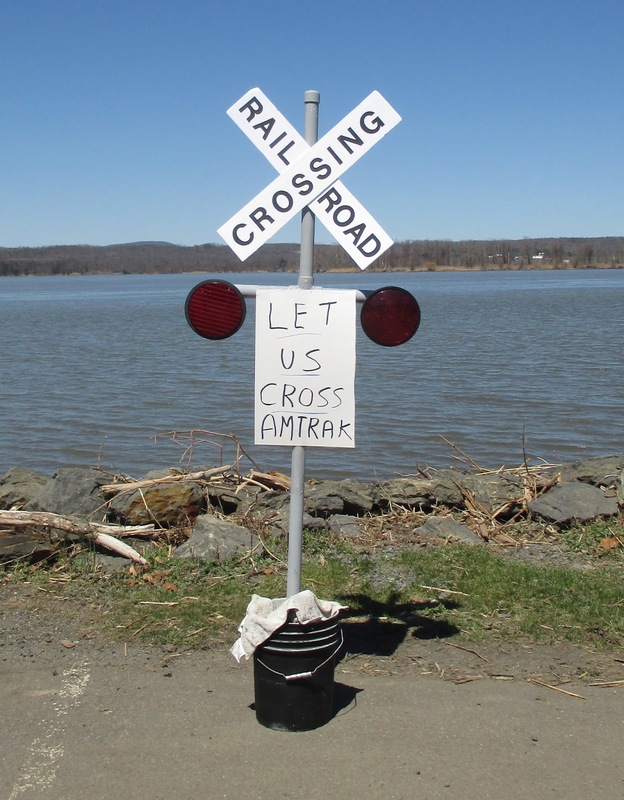 The public comment period on Amtrak's proposal to install fences and gates at various points along the Hudson River ends tomorrow, May 1, at 4:30 p.m. Comments should be submitted by email to cr@dos.ny.gov, with the subject line "F-2018-0060." 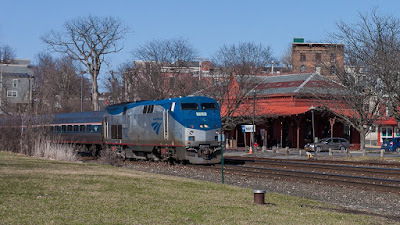 Meanwhile, Gossips has learned that a meeting about the fences and other plans Amtrak has for safety enhancements--plans that include Hudson--took place on Tuesday, April 24, right here in Hudson at 401 State Street. The meeting was arranged by Congressman John Faso. Present at the meeting were Faso, Assemblymember Didi Barrett, a representative for State Senator Kathy Marchione, the supervisors of Germantown, Stockport, Stuyvesant, and Rhinebeck, the mayors of Hudson and Tivoli, and officials from the NYS Department of State, the NYS Department of Transportation, and Amtrak. 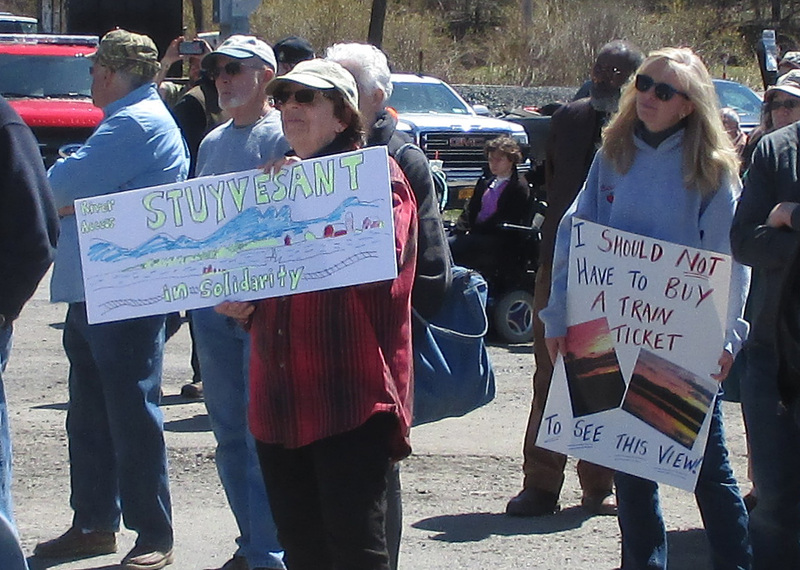 William Shannon reports what he has been able to learn about the meeting on his blog, Hudson River Zeitgeist: "Confusion and 'radio silence' in waning hours of Amtrak plan's comment period." In his post, Shannon mentions a meeting to be hosted by Mayor Rick Rector tomorrow to "discuss with a few members of the press what Amtrak may possibly be now proposing in Hudson." Gossips is one of those "few members of the press," and a report about what was learned will appear on Gossips as soon as possible after the meeting. Yesterday, Gossips was invited to attend the groundbreaking for a mosque in Hudson. In addition to Gossips, representing some form of media, there were reporters from the Register-Star and Columbia Paper, Dan Udell with his video camera, and a woman who said she was making a video about the building of the mosque. It seemed every elected official in Hudson, near Hudson, or representing Hudson had been invited to attend, along with the city judges and the superintendent of the Hudson City School District, and all of them were asked to speak. The picture below shows the lineup of elected officials in place when I got there at noon. Others arrived during the next half hour. Before the actual groundbreaking took place, people gathered in a tent for speeches of praise and congratulations. 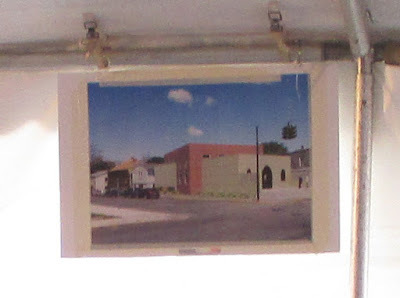 Displayed about the tent were renderings of the mosque to be constructed which show that the design has been somewhat altered, mostly in the type of materials to be used, since the project was granted area variances by the Zoning Board of Appeals in October 2015. Construction of the mosque is expected to take 12 to 14 months and to cost $1.5 million. Alderman Shershah Mizan (Third Ward) told the Register-Star that less than half the money has been raised. 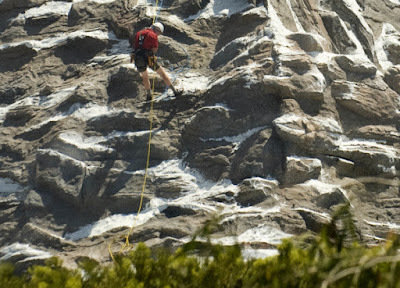 Mizan is quoted as saying, "We've got a big, long way to go." 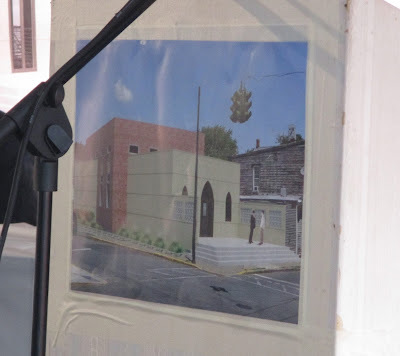 Despite the challenge of having to raise another $750,000, there was an air of celebration and achievement as members of the Islamic Center, some wearing hard hats, broke ground with shovels and a pick axe. Today the Muslim community in Hudson will be celebrating the Ground Breaking of our Islamic Center. After +20 years our community is finally ready to start building our center. Words cannot describe how happy and excited I am for this new chapter. This establishment is an essential part of my life, as it is for many others. But despite how much this community center means to me and many other Muslim women--we were excluded from today's celebration. The board did not think it was necessary or important to include more than half of the Muslim community which consists of women and young girls. During the planning process of this gathering it was announced that the men in our community cannot accommodate for the women. Although the invitation letter said "dear brothers and sisters," the men were explicitly told that women are not a part of this gathering. It is so upsetting that the beautiful religion of Islam--that promotes equality, equity, and peace--is being misinterpreted and promoted as a religion that only serves men. . . . The Hudson Islamic Center is a space for everyone regardless of age, gender, spiritual standing, faith/no faith, political affiliation, nationality, or social status. But unfortunately it has been turned into a social center for Bangladeshi men ages +40. I ask my fellow community members to question, ask, and demand that Muslim women be at the forefront of this establishment. I ask that the women who were invited, who were respected and seen as equal, speak for the women who were not seen at all. I ask that my Muslim sisters demand equality! Because Islam is for everyone not just those with a particular reproductive organ. The following explanation for the absence of women at the event, attributed to Mizan, appeared in the Register-Star: "No female Muslim worshipers were in attendance at the ceremony as a separate space is needed for female worshipers and the center couldn't accommodate it, Mizan said." 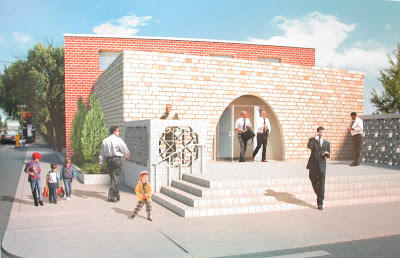 Last week, I was asked by Shershah Mizan, City of Hudson 3rd Ward Alderman, if I would like to videotape the groundbreaking ceremony of the Islamic Center. It seemed like a good idea, and this is the result. In the interim, a firestorm has erupted about the lack of Islamic women at the event. I guess I'm naive: the thought never occurred to me. I have since read the wonderful, courageous Facebook statement by Jabin Ahmed Ruhii. I came to do a simple videotape, but I left with a profound appreciation of a young generation of Americans who continue to uphold our cherished values of equality and freedom for all our citizens--male and female. Udell's videotape of the groundbreaking event can be viewed by clicking here. Three years ago, in April 2015, the discussion of creating a vacant building registry in Hudson and requiring owners of buildings held vacant for extended periods to pay an annual fee was introduced in the Common Council Legal Committee. That was back when John Friedman chaired that committee. 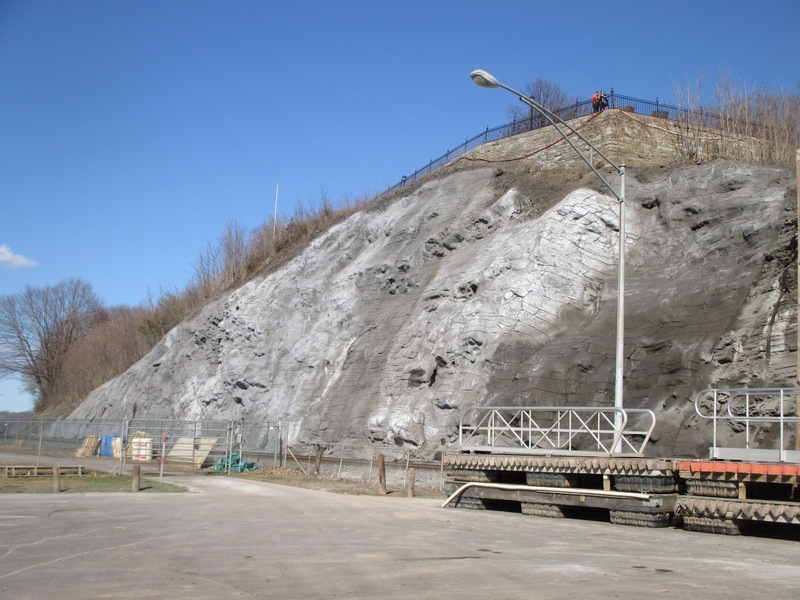 In the ensuing years, the topic has come up from time to time, but no actual legislation, tailored to the unique situation in Hudson, has ever been drafted. At the Legal Committee meeting this past Wednesday, Alderman Tiffany Garriga (Second Ward) once again brought up the issue of a vacancy registry, complaining that it has been before the committee for months (actually, it's been years), and there has been no progress. She urged the committee to look at similar legislation in Albany and Watervliet and use it to draft legislation for Hudson. Alderman John Rosenthal (Fourth Ward), who chairs the committee, suggested that the committee should wait until the mayor's Housing Task Force completes its work. 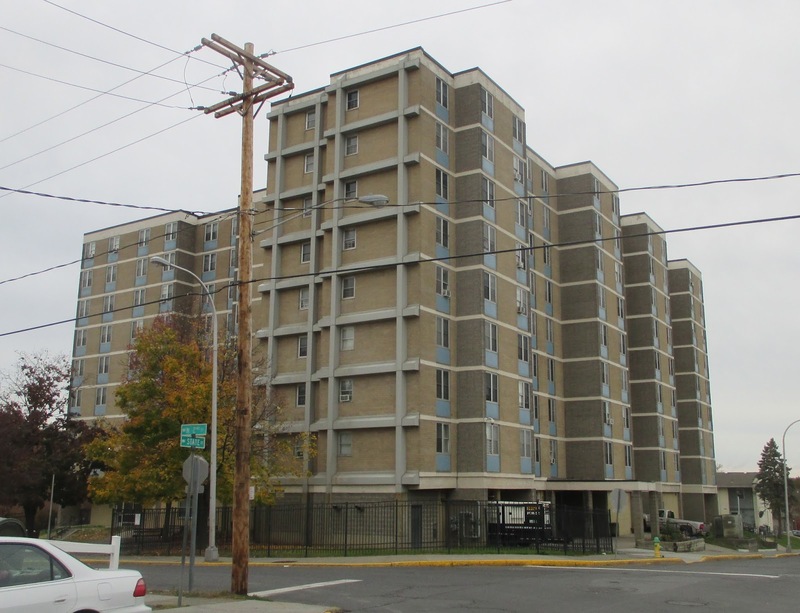 The subject of vacancy came up at Friday's meeting of the Housing Task Force. It seems the issue of vacant buildings will be addressed in the Strategic Housing Action Plan being drafted by the group. The subject was broached when Joe Czajka, senior vice president of Hudson Valley Pattern for Progress, who is chairing the task force, commented that there are buildings in Newburgh that sit vacant for decades. Mark Morgan-Perez expressed the opinion, "If a person's strategy is to buy a property and sit on it, they should pay." Morgan-Perez's statement brought to mind something said by Tom Swope back in March 2012 when he was the executive director of Galvan Initiatives Foundation. Speaking on the WGXC radio show @Issue, Swope explained that previously it had been "hard to justify economically" developing all the properties Eric Galloway had acquired, but "under the guise of the foundation," which at that point had only just been created, "we can make it make sense." On Friday, Dan Kent, the current vice president for initiatives for the Galvan Foundation, responded to Morgan-Perez's statement by saying, "That's going to add to the cost of the rent, because it will cost more to develop a property." Kent went on to say, "Is [a vacancy tax] an effective incentive? 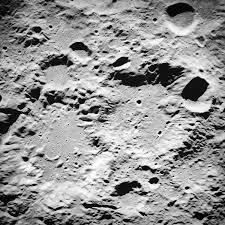 From our perspective it is not." Although the Strategic Housing Action Plan does not yet seem to be in its final form, it is anticipated that it will be adopted by the Common Council by the end of June. It is expected that the document in its current form will be presented to the Common Council Housing and Transportation Committee at its next meeting, which takes place on Wednesday, May 2, at 6:45 p.m., in City Hall. Last week, I shared an article from the Columbia Republican that provided extensive information about the parade being planned to mark the arrival of the Liberty ball and the Liberty coach in Hudson. 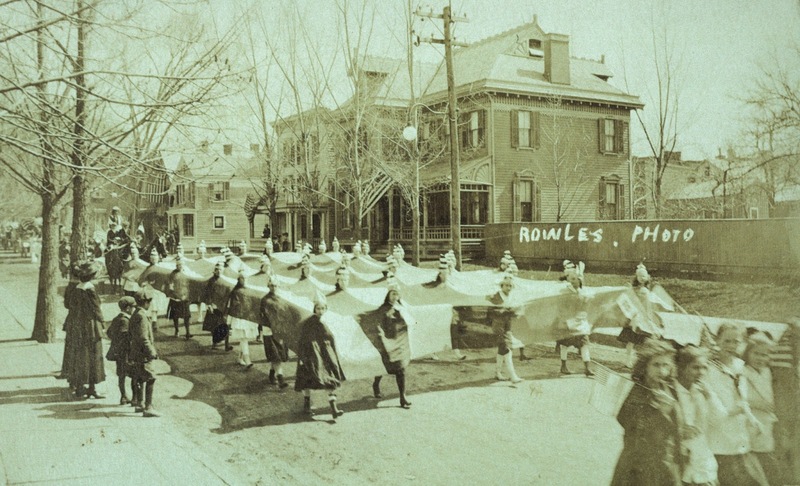 One of the "novel features" planned for the parade was a contingent of local canines done up like Red Cross war dogs. 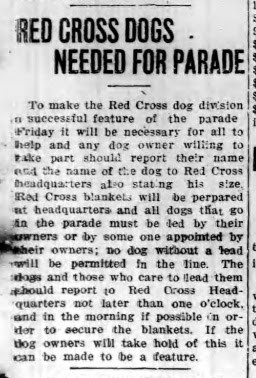 My interest piqued by the inclusion of dogs in the parade, I researched and shared some information about the Red Cross war dogs in World War I. I overlooked, however, this appeal to the dog owners of Hudson, which appeared elsewhere in the Columbia Republican on that day. Gloriosky! It's not raining, the sun is out, and the temperature at this hour is almost 50 degrees. Could it be spring is finally here? A sure sign of spring is that the Hudson Farmers Market returns to its old stand at Sixth and Columbia streets this morning to begin its 21st season. 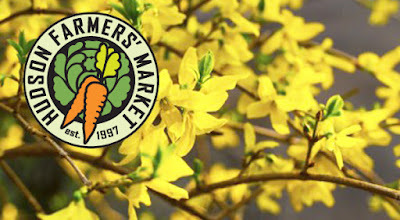 The market is open from 9 a.m. until 1 p.m. It's the place to see and be seen. Gossips will see you there! Anyone who has visited the Council Chamber in City Hall knows that its walls are lined with portraits of Hudson's mayors--from Seth Jenkins (1785-1793) to William H. Hallenbeck, Jr. (2012-2015). Missing are our most recent former mayor, Tiffany Martin Hamilton (2016-2017), and our current mayor, Rick Rector. On the mantelpiece in the room are displayed pictures of our representatives to the state and federal legislative bodies: Didi Barrett, NYS State Assembly; Kathy Marchione, NYS State Senate; John Faso, US House of Representatives; Chuck Schumer and Kirsten Gilliband, US Senate. Earlier this week, a new picture appeared at the center of the gallery, with Barrett, Schumer, and Gillibrand (Democrats) arrayed at the left, and Faso and Marchione (Republicans) at the right. 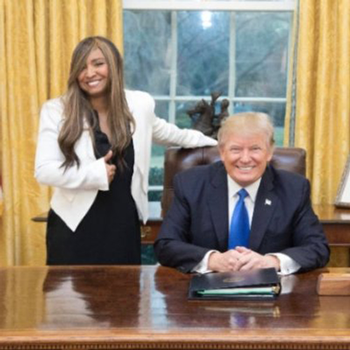 Yup, that's a cropped copy of the official portrait. On Thursday night, at 6:00 p.m., the History Room at the Hudson Area Library presents the latest in its Local History Speaker Series: The History and Work of Preserving the Jan Van Hoesen House by Ed Klingler. If you have driven by this distinctive Dutch colonial style house on Route 66 near the Dutch Village Mobile Home Park and wondered about its mysterious presence, now is your chance to learn about its history and significance from Ed Klingler, the co-founder of the Van Hoesen House Historical Foundation and a builder specializing in accurate historic restorations for more than forty years--an interest cultivated by the Van Hoesen house when he was a child growing up in Columbia County in the 1960s. 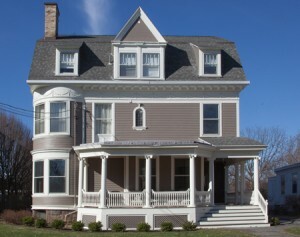 The house was described by Ruth Piwonka, author and local historian who wrote the house's nomination for individual listing in the National Register of Historic Places, in this way: "The Jan Van Hoesen house is one of approximately seven brick dwellings that survive from the first half of the eighteenth century and that represent a colonial architectural style unique to the Dutch community of old Albany County during that period." 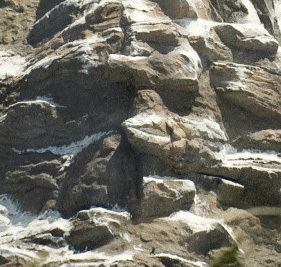 A question-and-answer period and refreshments will follow the talk. 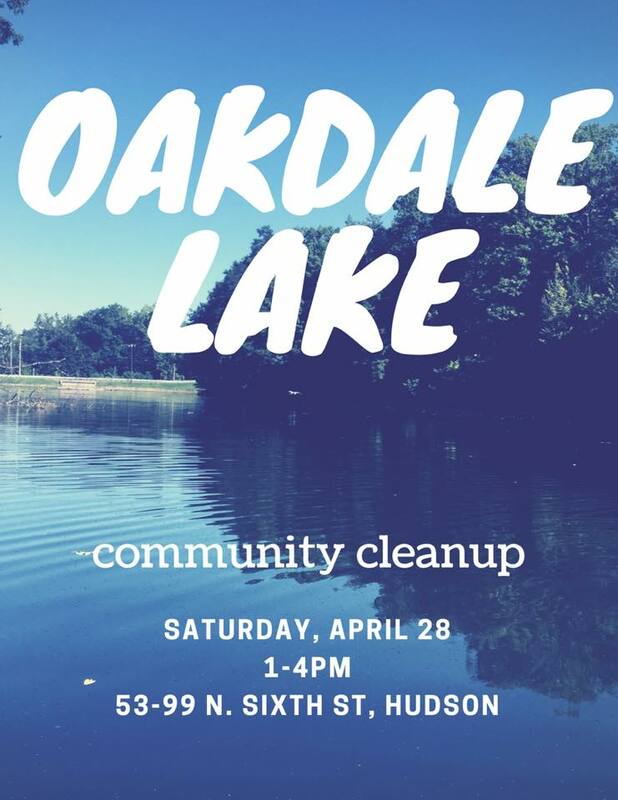 The event is free and open to the public and takes place in the community room of the Hudson Area Library, 51 North Fifth Street. Donations to the Van Hoesen House Historical Foundation can made at the event. 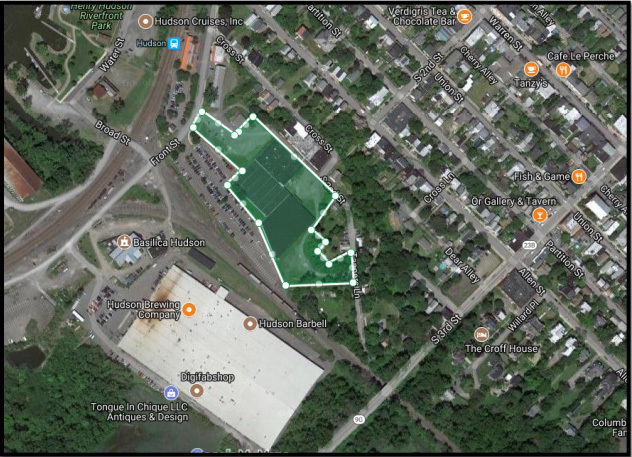 Earlier this month, the board of Hudson Development Corporation held a special meeting to consider the three proposals they had received for the redevelopment of the Kaz site. 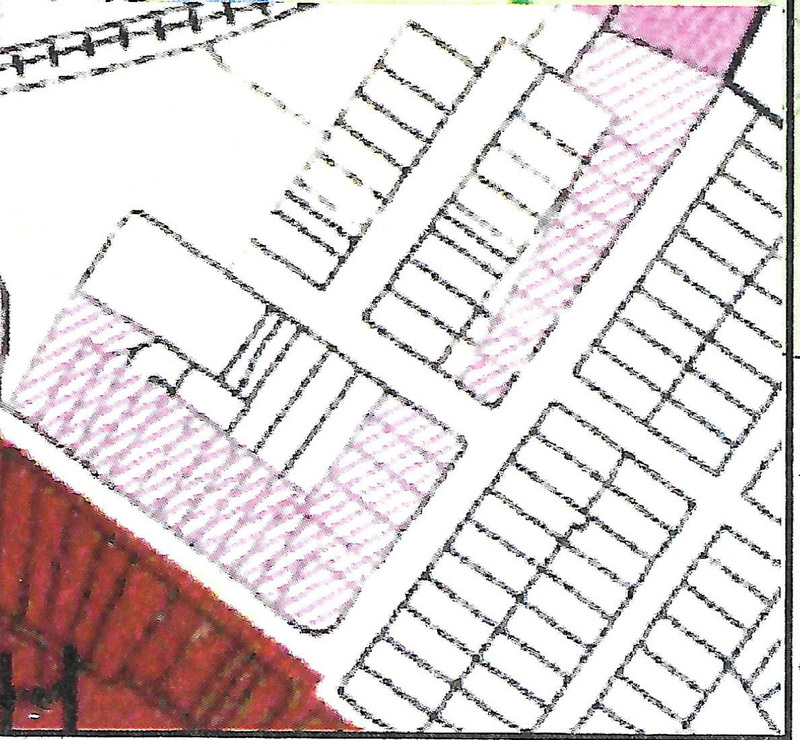 At the beginning of that meeting, the public got a chance to learn about what had been proposed by the three developers--Bonacio Construction, Kearney Realty & Development, and Redburn Development. After the public session, the board went into executive session for further discussion, during which they decided they wanted to make site visits to past projects by the developers and they wanted further financial information--such things as project budget, tax issues, and PILOT (payment in lieu of taxes) expectations. It was this financial information that the HDC board was to discuss yesterday in executive session. Before that, Sheena Salvino, executive director for HDC, presented the communications that had been received. One of those communications was a letter from Melissa Auf der Maur, co-founder and director of Basilica Hudson. Auf der Maur was present at the meeting and spoke about its content. The gist of her message to the board was that development of the Kaz site was moving too quickly. She called the Kaz site "a significant turning point for the extension of downtown" and, referencing the Downtown Revitalization Initiative (DRI) and the Local Waterfront Revitalization Program (LWRP), argued that the the RFP (request for proposals) for the Kaz site should not have gone forward "until the greater context is clear." She suggested that waiting until after the DRI and LWRP were completed "could have inspired more people to submit proposals." She lamented what she perceived as a closed selection process, saying, "If we, the invested property owners, feel out of the loop, how can this turn out well?" She went on say that the project was "taking off without the proper, world-class planning" it deserved. Another member of the public present, Jeffrey Yeh agreed that the project was moving too fast. The deadline for submitting proposals had been six weeks from when the RFP was issued, and Yeh maintained this was not enough. "A lot of people are interested in this project," he told the board, "but the whole process was rushed." He spoke of Hudson being "on the national stage," inspiring interest "all the way to California," but he said the deadline had been too quick for many developers to prepare proposals. In the face of this criticism, the board initially seemed genuinely speechless. Responding to Yeh's claim that interested developers didn't enough time to prepare proposals, Salvino and board member Don Moore told Yeh that no one had contacted HDC asking that the deadline be extended. Reacting to Auf der Maur's complaint that the Kaz redevelopment project was going forward without being informed by input from the DRI process, Moore asserted "the amount of integration between the DRI and Kaz is remarkable." He assured Auf der Maur that the developers were aware of need to integrate the new development into the larger context of the city and told her, "The proposals are not cookie cutters." 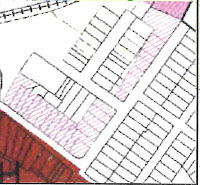 HDC board member Seth Rapport, who was also a member of the DRI Local Planning Committee, told Auf der Maur that at the special meeting the developers were "quizzed on DRI issues" by the board. John Gilstrap, who is now president of the HDC board, expressed surprise that anyone from California would be interested in the project "because of the economics." Auf der Maur remained concerned about possible "conflicted uses" and how the proposed new development will "coexist with what is." Moore, who expressed his opinion that he didn't want Hudson to become downtown Saratoga, told Auf der Maur, "If we decide on a developer in three months, that's not the end." 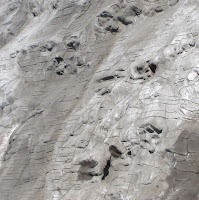 Earlier Rapport had explained, "How an accepted proposal is going to morph into that is actually built will be a very public process"--a process that is expected to take six months. 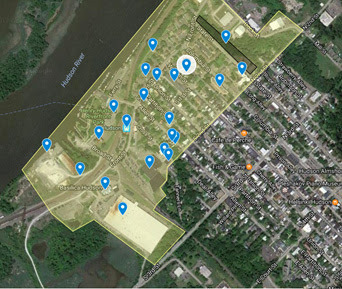 KAZ (and the Dunn warehouse too), are the last significant lots to be developed in Hudson’s re-envisioned waterfront. They must reflect the community desires brought to light during the DRI, be innovative, thoughtful, inspired; affordable workforce housing; offer opportunities for jobs and job training programs, family activities; be built resiliently for rising waters, energy efficient; and be affordable and accessible for all of Hudson. After participating in and observing the DRI process, it has made us more acutely aware of how important it is that we take a step back to plan our waterfront holistically, with these two big anchor projects at the center. To stabilize Dunn and clean up/demolish KAZ is of great importance, but in the coming year between the DRI momentum and the LWRP revision, there will be so much more potential, interest and understanding of the context for these prime projects. 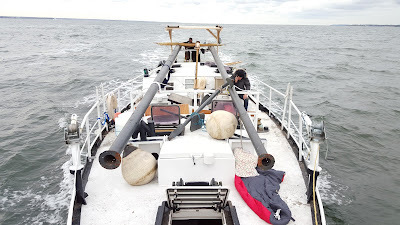 It's been almost three years since Gossips told the story of Apollonia and followed its journey from Buzzards Bay to the Hudson River. Now, to quote one member of the Apollonia crew, "with a little luck and a little community support," the schooner powered by the wind and recycled vegetable oil will be making deliveries this season. In the meantime, in the month of May, Apollonia is partnering with the Hudson River Maritime Museum in Kingston to offer classes in creating and restoring parts of a working sailing vessel. The museum will be offering three classes as part of the series: Wooden Block and Mast Hoop Build; Wood Finishes: Varnish and Oil; Ropework: Splicing, Whipping, and Making Grommets. Apollonia will be at the Hudson River Maritime Museum docks for several weeks in May as crew members and volunteers work to finish rebuilding her traditional sailing rig. “We are so excited to team up with the Hudson River Maritime Museum this spring to build many critical parts of the rig, including blocks, mast hoops, and running rigging,” says Sam Merrett, of the Apollonia. Visitors are welcome to watch the work and learn more about the boat. Those interested in learning about traditional vessel rigging and how to repair and maintain their own vessels are invited to register for any of the three courses offered this spring. In Wooden Block and Mast Hoop Build, students will work with two lead instructors and three assistant instructors to shape and construct rope-stropped blocks and wooden mast hoops for Apollonia. In Wood Finishes: Varnish and Oil, led by Riverport Wooden Boat School instructor Brian Donahue, students will explore various techniques of wood finishing and will get hands-on experience varnishing spars for Apollonia, using traditional schooner varnish. In Ropework: Splicing, Whipping, and Making Grommets, students will work with experienced sailor and knot enthusiast Christin Ripley to learn how to make eye splices, lay a grommet for rope strop blocks, and make proper whippings and seizings. All student-made products will be used on board Apollonia. The Wooden Block and Mast Hoop Build class meets Saturday and Sunday, May 12 and 13. Wood Finishes and Ropework classes run concurrently on Saturday and Sunday, May 19 and 20. Click here for more information and to register. It's been a while since Gossips has reported about life in Hudson a hundred years ago, when the country was fighting the Great War--World War I. 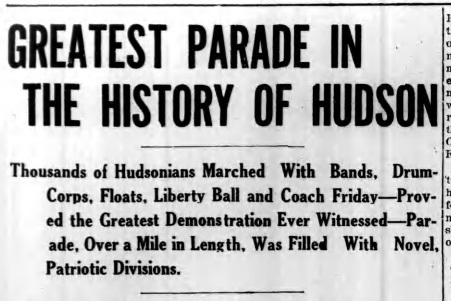 A hundred years ago today, April 23, 1918, one of the stories on the front page of the Columbia Republican told of plans for a parade to take place in Hudson on Friday, April 26. Along with impressing us with how quickly Hudson could put together a parade a hundred years ago, the article definitively identifies the parade that was the subject of these photographs, found in the Evelyn and Robert Monthie Slide Collection at the Columbia County Historical Society. 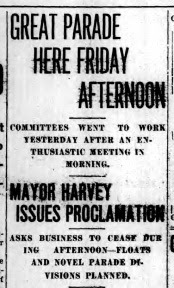 With the weather man promising fair and warmer weather for latter part of this week, with innumerable committees hard at work, and with proclamations issued by President Wilson and Mayor Charles S. Harvey, requesting that all places of business close for a half-holiday, Liberty Day--next Friday--looms up as one of the biggest days on the calendar of local events the city has seen in many years. On that afternoon in Hudson a Liberty Loan demonstration will take place, the equal of which has never been witnessed in Columbia county before. 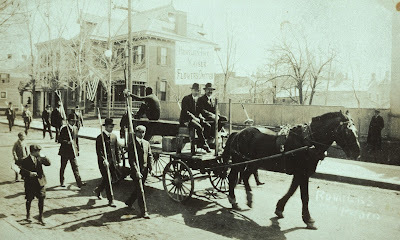 There is going to be a parade that promises to be the greatest affair held here since the Hudson-Fulton celebration; there will be patriotic gatherings and speaking; there will be a day in which all--young and old, poor and rich--will join hands in helping send the Liberty Loan over the top with a bang. And then there will be additional features. 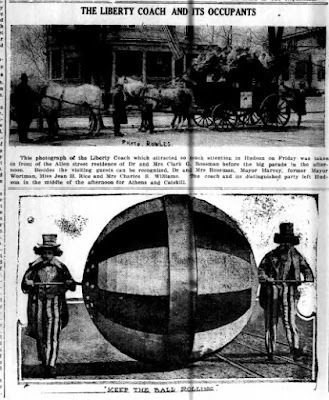 By a coincidence the Liberty ball and the famous liberty coach, which are traveling across the State from Buffalo to New York city in the interest of the loan, are scheduled to be here. They will, therefore, be a part of the great procession. Everywhere in [the] State where the ball and coach have been seen wonderful demonstrations have been held as patriotic receptions, and Hudson with the arrival on Liberty Day will go every city one better--and maybe two or three. Yesterday morning in the Common Council chamber, the general parade and demonstration committee appointed by Chairman William Wortman, of the local Liberty Loan campaign, met and discussed the plans. The idea is to have something beside a procession--something that will be worth going miles to see, and this is just what is going to be the result of the work of the committees in charge. The demonstration will no doubt attract many from all parts of the county and of Greene county as well. Roughly, the plan is to have a parade with at least two bands and five drum corps, many decorated floats of attractive designs and in keeping with the patriotic purpose of the day. All local organizations of all kinds are invited to take part and last night it was learned that but few if any will not march in a body. The Hudson police will march and it is certain that the firemen of the city will turn out as well as Co. F. There will be a division of flag-bearers in which all the flags of the allied nations will be carried. There will be new divisions also. Among the novel features will be the Red Cross war dogs. Local canines will be blanketed and equipped in the same manner as the dogs who are doing such valuable service on the battle field. There are many other similar features on which the committee is working and will announce the full plan in a day or two. It is proposed to have the parade start at 1:30 o'clock. One of these will be a service flag division. It is proposed to have every family in Columbia county, if possible, which has a boy in Uncle Sam's service, represented in the parade by a service flag. The home guards of Chatham, Hillsdale and Philmont will be invited to take part, as well as the Boy Scouts of Athens, the Camp Fire Girls of Kinderhook and other towns in the county and the Girl Scouts of Blue Store. 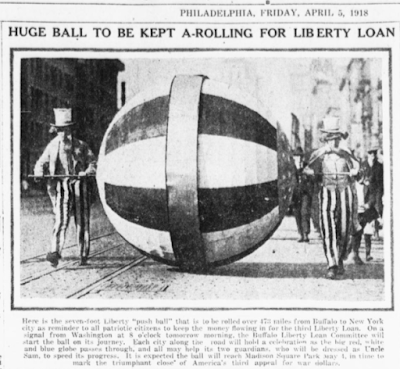 This picture of the Liberty Ball appeared in the Philadelphia Evening Public Ledger in April 5, 1918. 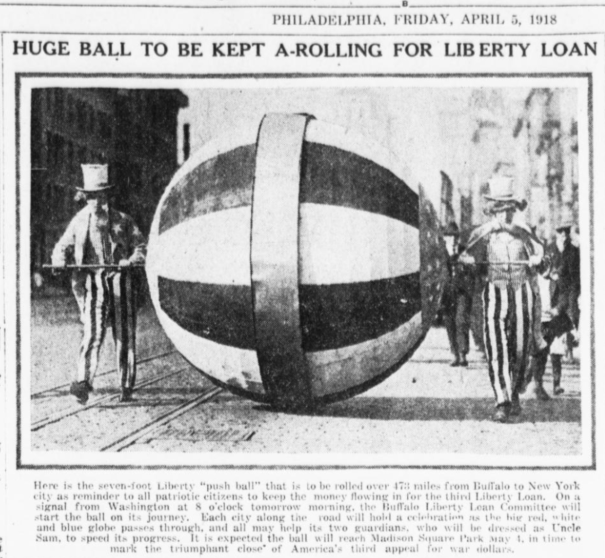 The caption below the picture reads: "Here is the seven-foot Liberty "push-ball" that is to be rolled over 473 miles from Buffalo to New York city as a reminder to all patriotic citizens to keep the money flowing in for the Third Liberty Loan. On a signal from Washington at 8 o'clock tomorrow morning, the Buffalo Liberty Loan Committee will start the ball on its journey. Each city along the road will hold a celebration as the big red, white and blue globe passes through, and all may help its two guardians, who will be dressed as Uncle Sam, to speed its progress. It is expected that the ball will reach Madison Square May 1, in time to mark the triumphant close of America's third appeal for war dollars." It seems pretty clear that giant globe being rolled down Union Street in the picture below is the Liberty ball, perhaps looking a little worse for wear, followed by the Liberty coach, passing through Hudson almost right on schedule--twenty days after it left Buffalo and four days before it was due in New York City. One wonders, though, what happened to the guardians dressed as Uncle Sam. Two men rolling the ball appear to be dressed as soldiers. Perhaps, after walking all the way from Buffalo, they were getting a well-deserved rest here in Hudson. 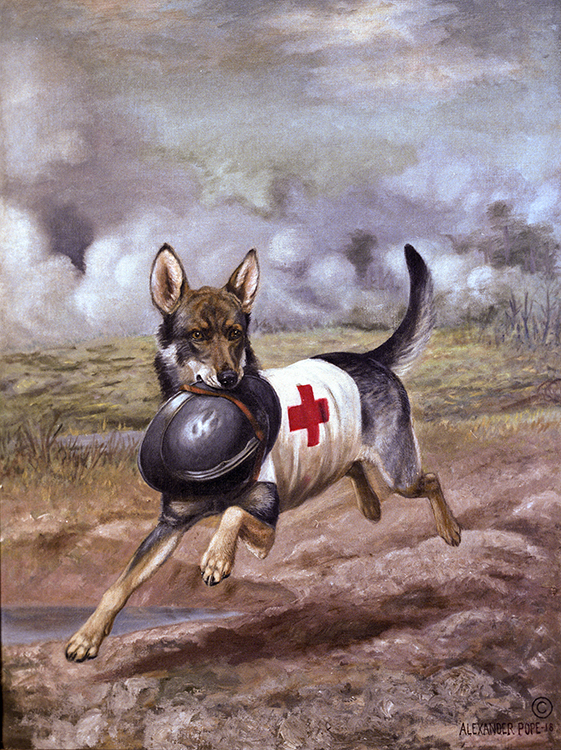 Curious to know more about Red Cross war dogs and how the local canines would have been outfitted to appear like them, I found a blog post on the American Red Cross website and learned that the war dogs were also known as "ambulance dogs," because they were attached to ambulance units and were trained to find wounded soldiers. 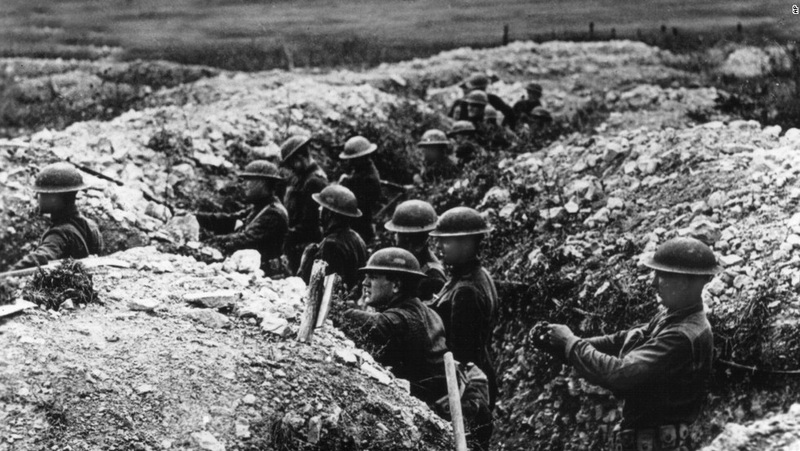 They were even trained to recognize uniforms so they wouldn't give aid to enemy soldiers. When a Red Cross war dog located a wounded soldier, it would get as close as possible so that the soldier could access the dog's saddle bags, which contained first aid supplies and rations. The dogs were trained not to bark, because that would alert the enemy. Instead they would bring back something that belonged to the soldier. This painting by Alexander Pope shows a Red Cross dog returning with the helmet of a wounded French soldier in the midst of a gas barrage. War dogs in World War I also provided messenger and delivery services, carrying ammunition and rations through dangerous territory, and they acted as scouts and guarded strategic posts. 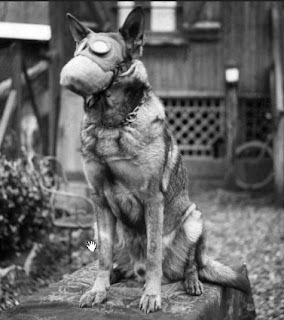 This photograph shows a French war dog wearing a gas mask. On Friday, the blog "Capitol Confidential" in the Times Union reported that two of the seven candidates vying to be the Democrat who will challenge John Faso in November are "taking steps to offset their carbon footprint during the campaign season." 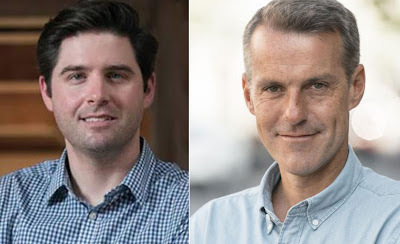 The candidates are Gareth Rhodes and Brian Flynn, and you can read about what they're doing here: "Congressional candidates address their carbon footprint."